Fall is a great time for cool weather crops. One of these crops is spinach. Spinach is a superfood that is loaded with tons of nutrients. The dark, leafy greens like spinach are low in calories and important to hair, skin and bone health. Nutrients such as protein, iron, vitamins and minerals are offered through spinach. Therefore spinach has the ability to possibly improve blood glucose control in individuals with diabetes, lowers the risk of cancer and improves bone health. Spinach has been a natural part of many diets throughout history. Those in the Mediterranean, Middle Eastern nations and South Easter Asian countries all considered spinach to be part of their cuisine. Spinach is perfect frugal easy food that can be made in many different dishes. It can be added as an ingredient to many dishes, cooked or served raw. Add all ingredients to a bowl and mix. Chill in refrigerator. Serve with crackers, bread or vegetables. Heat oil in a large, deep skillet or 3-quart saucepan over medium-high heat. Saute onion and pepper for 3 minutes. Then squeeze chorizo and add the remaining above ingredients. Lower heat and simmer for 30-40 minutes. As a farmer's grand-daughter I can recall my grandmother sending us out to the fields only after we put on a flannel shirt. In fact, one year she made each of us kids a flannel shirt of our own. Flannel was very important as we often went into the corn fields for one thing or another and to stay away from getting corn poison we wore the shirts as protection. They also helped keep off bugs, tics and whatever else may come our way. 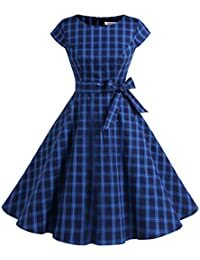 If you have ever noticed many of the flannel shirts and fabric used to make flannel shirts are plaid. I am sure that we celebrated Plaidurday way before it was even popular. Plaid has had a long run in history. The Celtic area during the early 8th BC era was most possibly where flannel was discovered. Mummies from that time period have been found by archaeologist also found plaid. 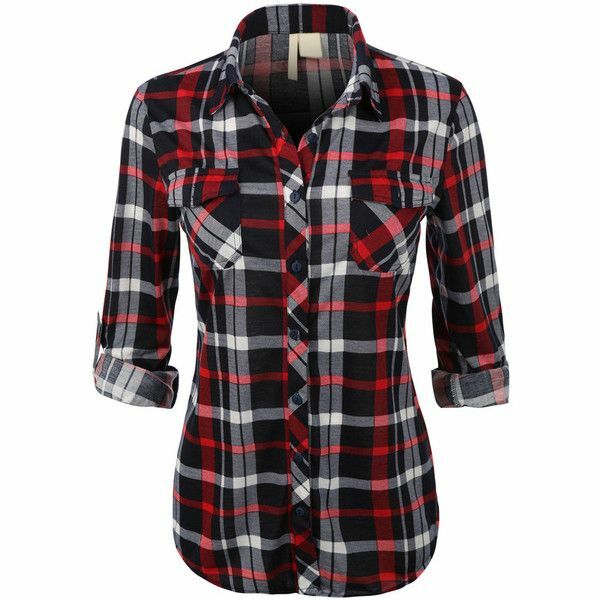 Plaid has been popular throughout time and is often used in stylish fashion trends as well. During the 1800s plaid was a fashion fad for the Scottish royalty. It only makes sense that there should be a holiday that simply celebrates plaid. October is a beautiful time of year. It is truly a time to give thanks. October offers us a chance to also show the pastor or clergy member some appreciation. October is Pastor Appreciation Month. The elders of our churches especially the leaders work hard and truly deserve to be shown respect and love. While the pastor may know that October is clergy appreciation month they will normally not ask for anything. But, if you took it upon yourself or formed a group to brainstorm ideas the pastor most likely would appreciate the expressive thought. While their approval comes from God they are also human and like a pat on the back like the rest of us. When the Lord calls that special individual to lead a church money is not at the center of thought. Many will go to much sacrifice for not only them but their family as well to do the job in which they were called for. Getting to know your pastor is a good idea and can be done any time of the year. Find out what they like and what they do in their free time. Do they like to get outside or shop any where special?? What is their favorite food or place to eat?? A gift of thanks to any of the things that he likes to do would not most likely be appreciated but deserved. Give the pastors family a bit of thought. It is the family that shares the man in their life with the church. They know that it is God that has the plan and is in charge but there are also times that they would just love to have their husband, father, son to their selves. A special card expressing the thankfulness and gratitude for the pastor is a great idea as well. This special note lets your pastor know that you think he is doing a good job. The gift of volunteering for projects that need help makes a great gift as well. At times the best gift a pastor could wish for is that individual that will show up and offer to help. Throughout history one of my favorite food products have been made with only flour and a bit of water. 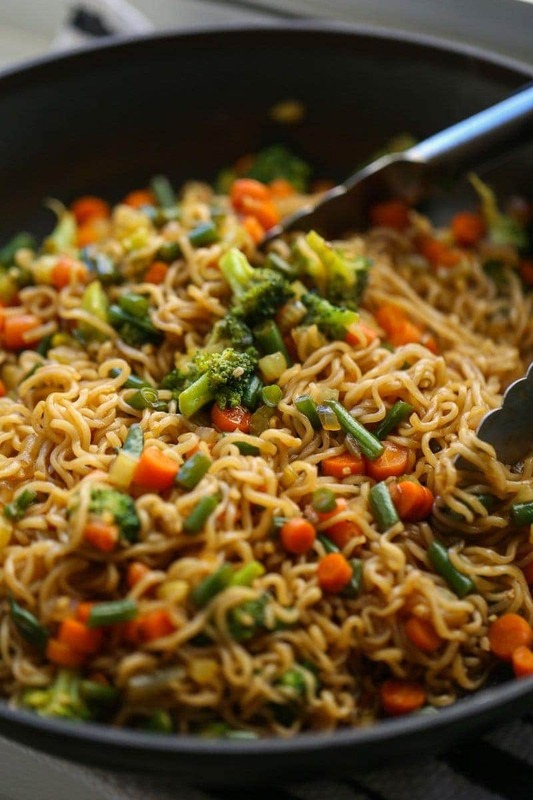 It is estimated that noodles date back to 1000 B.C. In 2002 archaeologists along the Yellow River in China found an earthenware bowl that contained some well preserved 4000 year old noodles. Noodles can and have been rolled into a variety of shapes. Noodles are found all over the world each just a bit different with their own specialties. Asian noodles are served with root veggies like yams, potatoes and beans. The noodles may be made up of rice, wheat, or buckwheat are often in a wide noodle form. In Europe noodles are created from semolina flour but potato noodles are a favorite as well. This stir fry creates its own sauce from the packet in the ramen noodles. Stir Fry: Saute garlic and onion, add other vegetables and protein of choice, add noodles and sauce. Dinner. Done. In 12 minutes. OK, so it’s 9 minutes longer than the Instant Ramen Soup …. but it’s a lot more interesting!!! Cut other crust into 1/2" strips. Frappe is a Greek foam covered iced coffee drink. The drink is made with a cocktail shaker or a mixer. In the shaker mix instant Nescafe coffee, water and sugar then add cold water or ice cubes and milk if you wish. Top the drink off when done with espresso and whipped cream. 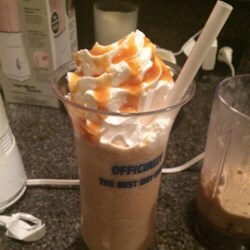 Frappe's are quite popular and trendy with a variety of recipes on how to fix them. The ice blended drinks is an international drink that according to the English dictionary means "to chill" It was made popular during the mid 1980s and '90s. Large stores would serve the frozen coffee beverages to the up and coming and others that were interested as well. Like many other things the Frappe was an invention base purely on accident. It came about during an International Fair in 1957 hosted in Thessaloniki. Nestle in Greece has been directly behind the marketing. Blend ice, coffee, milk, caramel sauce, and sugar together in a blender on high until smooth. Pour drink into two 16-ounce glasses. Don't turn off water with bare hand, rather grab a paper towel to turn nob on faucet. Germs like to gather on bathroom fixtures. While washing hands you will want to play close attention to your nails. This are a is a great place for serious bacteria and viruses to hide. E. Coli, strep, coronavirus and more can linger under your nails. There are special cleaners for nails that should be considered to use when washing hands. Surfaces should be cleaned and disinfected against virus and bacteria. Viruses love to hide on public surfaces, phones, doorknobs, pens and other items. 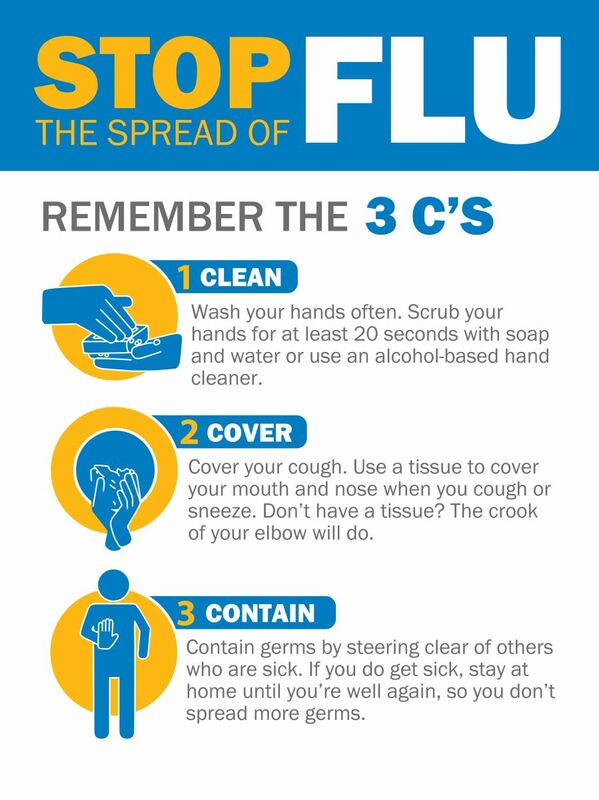 Cleaning often or keeping hand sanitizers close by and ready to use after touching public places is something that is truly needed. Cleaning will help to remove germs but when you also disinfect the germs are destroyed. To help protect your health take in lots of vitamins C and D. These vitamins help fight threats like the flu virus. Vitamin C is an essential nutrient needed. Dark leafy vegetables, kiwifruit, broccoli, berries, citrus fruits, and tomatoes. One of the best foods with high amount of vitamin C are bell peppers. Vitamin D also offers anti inflammatory and immune boosting properties that offers quite a punch for the virus leading to knock out, be sure that you take in plenty of vitamin D. Foods such as tuna, salmon, eggs, ricotta cheese and beef liver all offer vitamin D. Another great way to get vitamin D in your body is to head outside to get some sun. Sleep is an important part to staying healthy as well. During sleep our bodies rebuild and produce virus attacking cells that help strengthen the immune system. 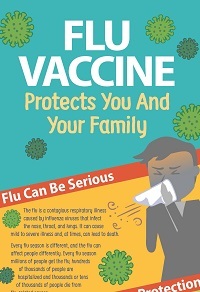 With today stresses and busy schedules pushing our selves too much can make our bodies vulnerable to viruses. Thus, 8 to 10 hours of sleep a night are required when striving to stay healthy. Having an active lifestyle is very important as well as getting exercise. Exercising for at least 30 minutes a day can help scare off illness. By strengthening your heart you are also building your immune system. A good immune system will be better off fighting away infections. Have you been to the orchard yet?? 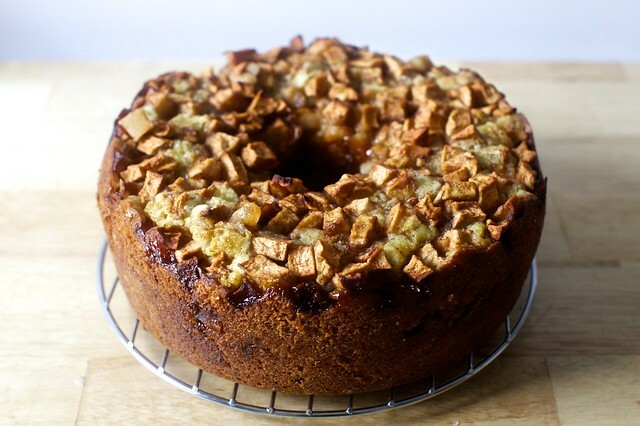 Tried any new apple recipes?? Want to?? 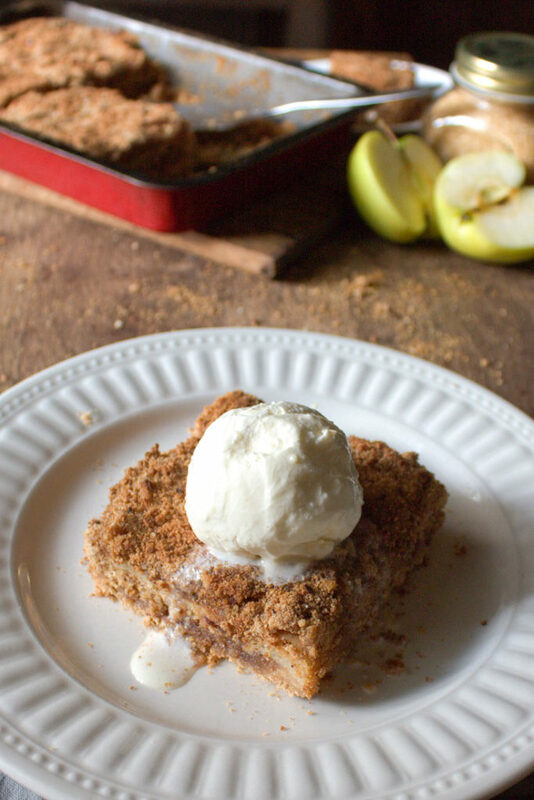 Here is one known as Apple Brown Betty. It is yet another version of that iconic apple pie. 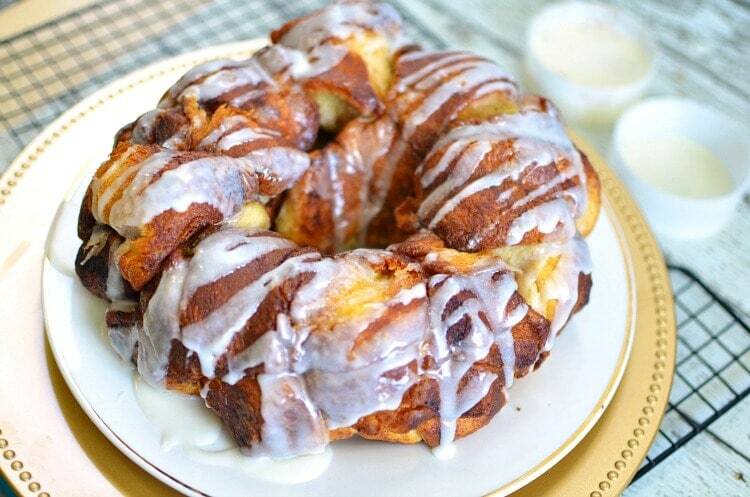 Not a lot of skills needed to create this delicious recipe and it takes less than an hour of baking. 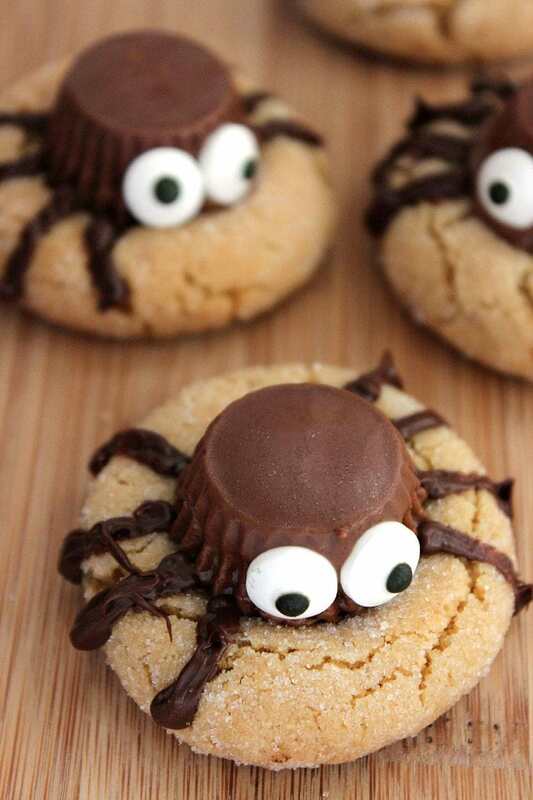 Those you share this crunchy mouthwatering dessert with will love it. First of all you should peel, core and slice your tart apples. Leave all slices in a bowl of cold water with some lemon juice in it. This trick will prevent apple slices from getting brown. Mix brown and white sugar with some ground cinnamon and nutmeg. Grease your baking tin and cover the bottom of it with one cup of breadcrumbs. Lay apple slices over. Next Sprinkle the apple layer with the sugar mixture and dot with butter. 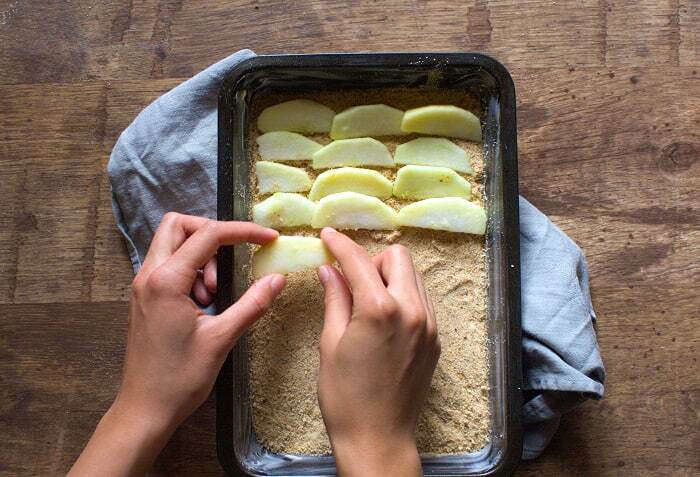 Repeat layers, pour water over top of apples, spread last cup of breadcrumbs on top. Cover Brown Betty with foil to prevent top from getting overly browned. Bake in 350 degree oven 50 minutes. The last 20 minutes should be without foil. Take out of oven and allow to cool. 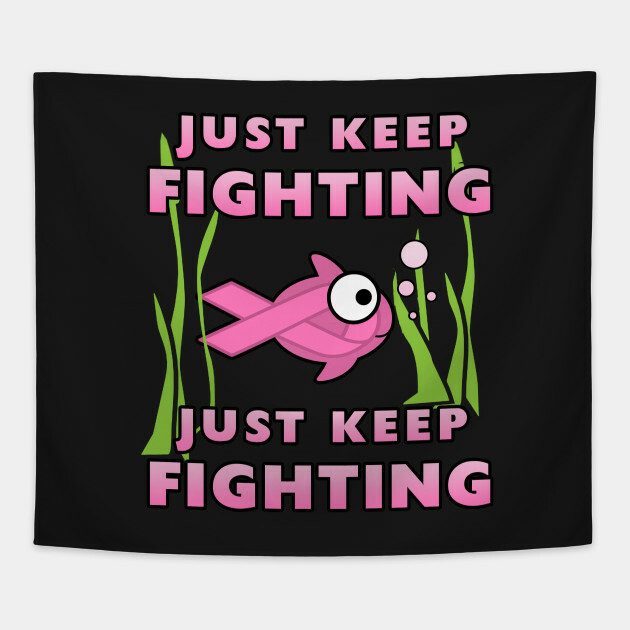 October 1985 was the first time National Breast Cancer Awareness Month was celebrated. The goal during the month of October is to promote mammography Many believe that mammograms are the most effective weapon in the battle against breast cancer. Many walks, runs, fundraiser and awareness events are planned and scheduled throughout the month in many different areas. Breast Cancer is the most commonly diagnosed cancer in women worldwide. It is the second leading cause of cancer death among women. In a single year over 250,000 breast cancer diagnoses will be made. In the same year more than 40,500 death due to breast cancer will occur as well. However, the good news is that the death rates from breast cancer have been declining in the past 30 years. Pumpkins, pumpkins, pumpkins everywhere.... or at least it seems that way. 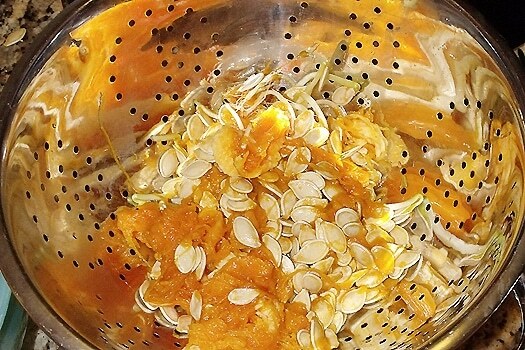 It most likely will seem that way even into November so sometime along the way you may want to try this cooking experiment to make roasted seeds and pumpkin puree. As long as the pumpkin is not squishy it can most likely be used. Thus, a good reason that no pumpkin should go to waste. Pumpkin puree can be frozen for later use in pumpkin pancakes, muffins or pie. 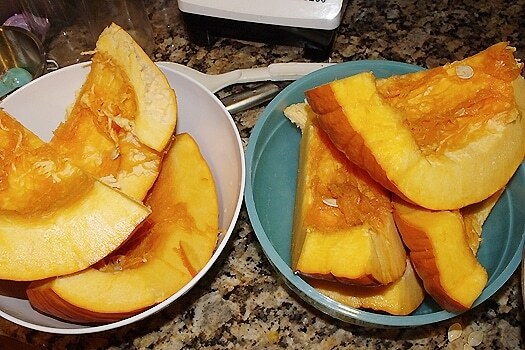 rinse the inside of a pumpkin Cut off top of the pumpkin , scoop insides out removing seeds. Trash any seeds that have all ready started to sprout. The chunks of pumpkin should be roasted at 350 degrees for an hour and half on baking sheets. The skin of the pumpkin should be fork tender. At midpoint of roasting, flip the pieces to the other side and continue baking. Remove baking sheets from oven and let pumpkin cool After pumpkin has cooled scrape pumpkin flesh from rind. Puree pumpkin. The puree is ready to be used or the pumpkin puree can then be portioned out into gallon baggies, labeled and froze When ready to use allow the puree to thaw in fridge or bowl of warm water. Seeds can be used but first must be washed and dried. 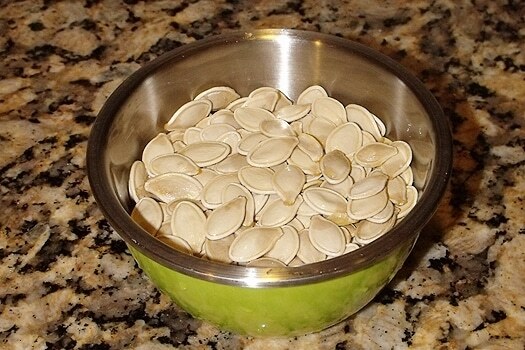 The seeds should be baked in 350 degree oven 20 minutes. Season however you desire. With these delicious ways to use a pumpkin they should never go to waste. Cabbage is one of the foods that was used in a grand variety of ways by peasants back in the day. I can only imagine that it has been used very creatively through out time. 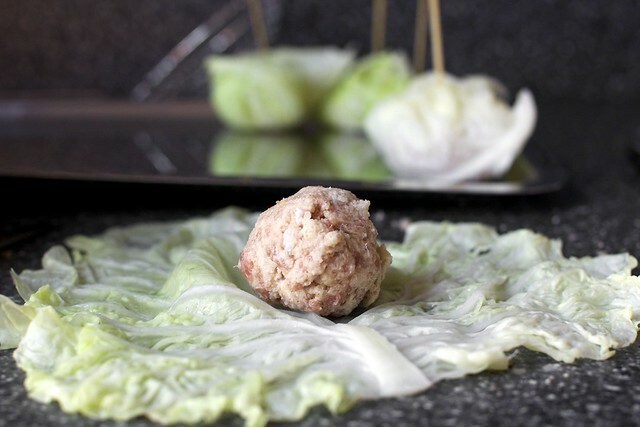 One way cabbage has commonly been used is by wrapping it around ground meat. This is a very budget minded way of cooking as you can mix the meat with other ingredients, wrap with cabbage and then cook in sauce. Large cabbage leaves appear perfect for stuffing. Ground beef and rice is a great mix to stuff cabbage leaves with. 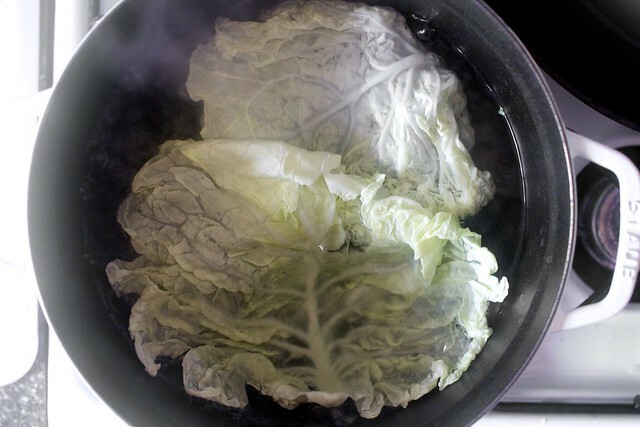 Prepare cabbage: Bring a large pot of salted water to boil. Discard any messy or broken outer cabbage leaves and carefully peel 12 nice, large leaves. (I think the cabbage can tell if you’re in a rush, and will tear more easily. Work carefully. That said, a torn leaf will hardly ruin the dish.) Blanch leaves for about 30 seconds to 1 minute (you can do a few at at time), until wilted, and spread out on towels so that they dry and cool. 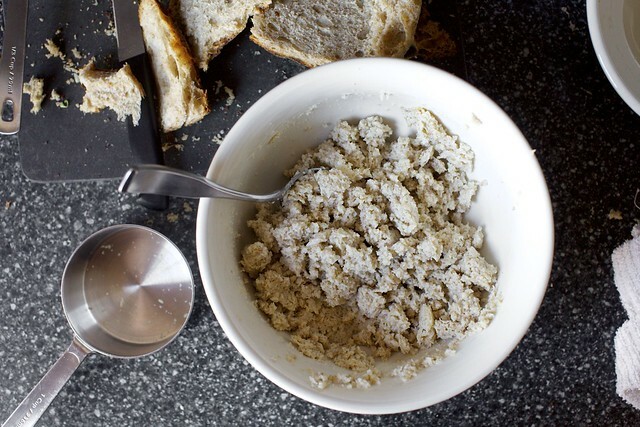 Make filling: Place bread scraps in bottom of large bowl and pour milk over. Let sit for a few minutes, then mash it gently with a spoon until something close to a paste forms. Mix with sausage meat, herbs, parmesan and a pinch or two of salt and black pepper; I find this easiest with a fork or bare hands. 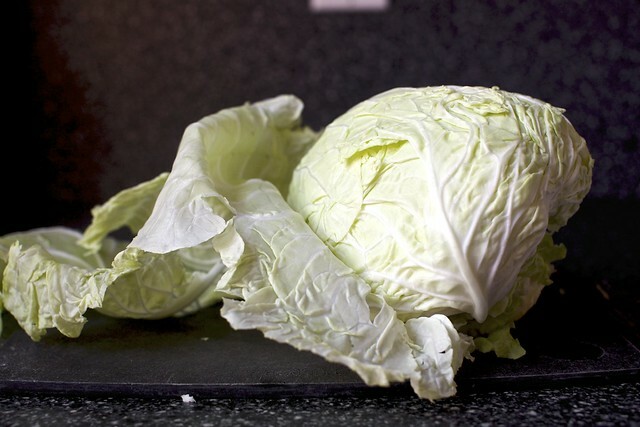 Make the cabbage rolls: Lay your first cabbage leaf on the counter. If it doesn’t want to lay flat, pare away some of the thickest stalk (with a paring knife or vegetable peeler) to make it easier. Form some of the filling mixture into a golf ball-sized round. Wrap cabbage leaf around it (see Note about shape up top) and pin at the top with a toothpick. Repeat with remaining leaves and mixture. Make the sauce: To prepare your tomatoes, either break them up with your hands (for bigger chunks), run them through a food mill or roughly chop them right in their can with scissors (what I did here). In a heavy saute pan with a lid or a medium (5 to 6-quart) Dutch oven, heat olive oil over medium heat. Add the garlic and saute for about 30 seconds (just until golden, not a moment longer) then add the tomatoes, bringing the sauce to a gently boil. Season with salt if needed. Add cabbage packages, arranging them carefully in the pan so they all fit, cover the pot and gently simmer them for 25 minutes. Remove the toothpicks and carefully turn the rolls over, cooking them for another 25. Remove the lid and simmer for another 10 minutes to cook off some of the wetness. They’re all cooked now, but if you can rest them for another 15 minutes before eating them, the flavors settle and they become even better. Kale, a member of the same family as cabbage and brussel sprouts. The mustard family contains many cold weather veggies. Kale is great for kale chips with its hearty and crisp texture and a taste of earthiness. There are several types of Kale each with a slightly different flavor. The younger leaves tend to be less bitter and fibrous than older ones. Kale is a green, leafy, winter vegetable high in fiber and potassium. Kale is also a very tasty nutritious side dish or goes nicely in smoothies and salads. Those taking blood thinning medications or with a kidney issue may possibly not be able to consume kale. Kale can help boost wellbeing and prevent a range of health issues. Kale contains fiber, antioxidants, calcium, and vitamin K that provide many health benefits. Kale also provides chlorophyll, vitamin C and iron. The large amount of fiber found in Kale may help lower blood glucose levels in those with diabetes. One antioxidant that Kale possess is alpha lipoic acid. This acid may help lower blood glucose levels, increase insulin sensitivity and prevent oxidative stress induced changes. It may also help curb neuropathy. Kale is a great food to eat if you are striving to improve heart health. 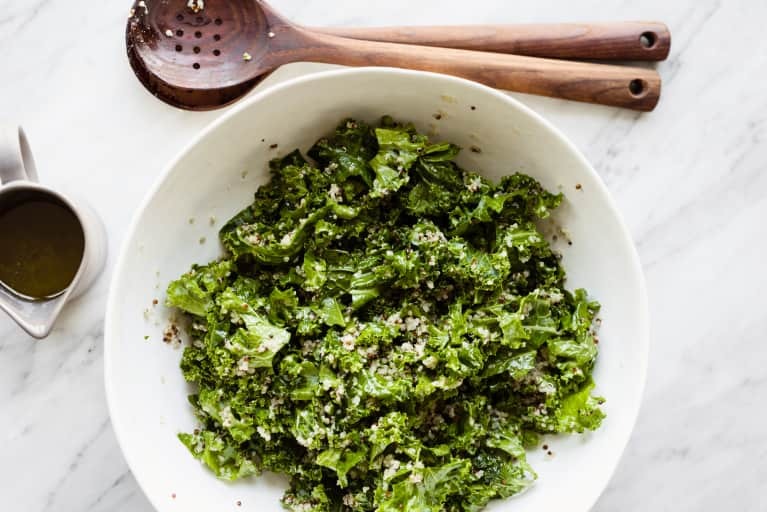 With fiber, potassium, vitamin C and vitamin B6 kale can help decrease sodium intake as recommended by diets for cardiovascular disease as well. The high amount of potassium also helps reduce risk of stroke, protects against the loss of muscle, preserves bone mineral density and reduces reduces chance of kidney stone. Like other green veggies kale contains chlorophyll that can help prevent the body from absorbing chemicals that are produced when grilling and have been associated with cancer Kale binds to the carcinogens and prevents the body from absorbing them thus cutting the risk of cancer. Likewise, kale helps keep the inside of your body working well by helping to prevent constipation and promote regularity and healthy digestive tract. The vitamins B and C found in kale helps promote iron absorption that helps the body release energy. Looking to help your appearance and feel better as well then kale is one thing you will want to add to your diet. The beta carotene in kale helps make sure all body tissues grow. Skin and hair is kept moist by the sebum that is created by the body. Eyesight as well as the immune system and reproductive system are helped via the vitamin A found in kale. The immune system is allowed a boost by kale and the vitamin C it has. The vitamin C is needed to absorb iron that helps the bodies immune system and prevent anemia. While Kale has many features that help boost the body there are a few risk factors to kale as well. Those with heart disease that take a beta blocker may want to check with doctor before consuming as kale can add potassium to the blood. Those taking beta blockers need to limit potassium foods. Likewise, those with kidney issues that can not consume potassium should not eat Kale. In a large sauce pan or a large tea kettle, heat cider and red hots over medium high heat, constantly stirring. 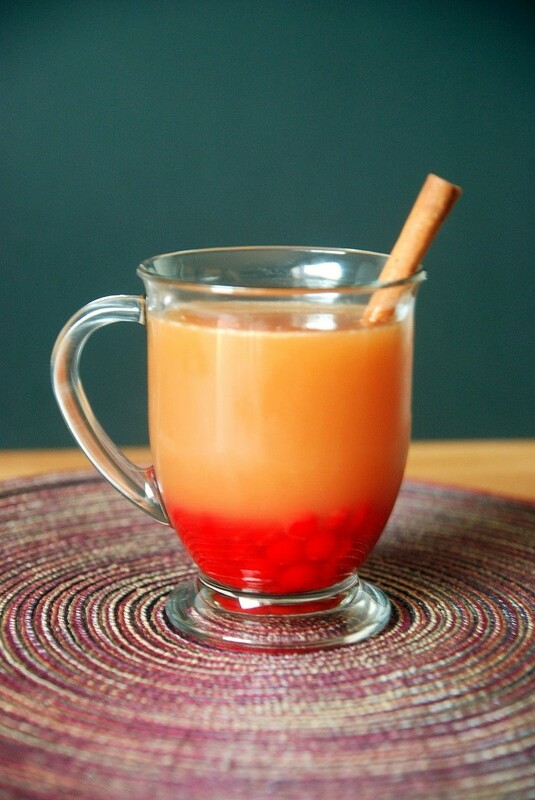 Once red hots have completely dissolved, remove from heat, and serve in mugs! Garnish with a cinnamon stick if you want to get fancy. Preheat oven to 350. Lightly spray one large rectangular baking dish or 4 individual baking dishes with olive oil. 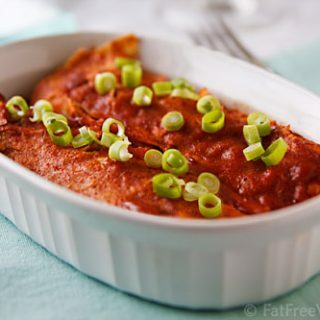 Place a thin layer of enchilada sauce on the bottom of each dish, reserving most of it to go on top. Microwave the tortillas for about 20 seconds to soften them. Place a tortilla in front of you and arrange about 1/4 cup of the bean mixture across the center. Roll up and place seam-side down into the baking dish. Repeat with remaining tortillas and beans. Pour the remaining sauce over the top. 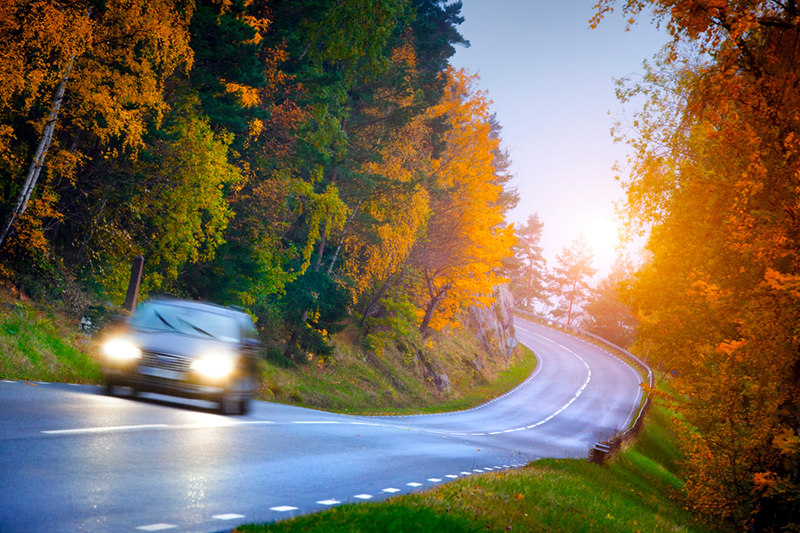 Make sure your brakes and tires are in good condition. Bad weather could leave roads hazardous, having good tires and brakes is very important. Check tires for wore areas if you find any you may need to replace the tires Many times tire shops will inspect the car to see if new brakes and tires are needed if you are unsure. As my daughter in law says the season means shorter days and longer nights. This is why it is important to check the lights. All lights including headlights, taillights, parking lights, brake lights, and emergency flashers should be checked. Any in non working condition should be repaired and / or changed. 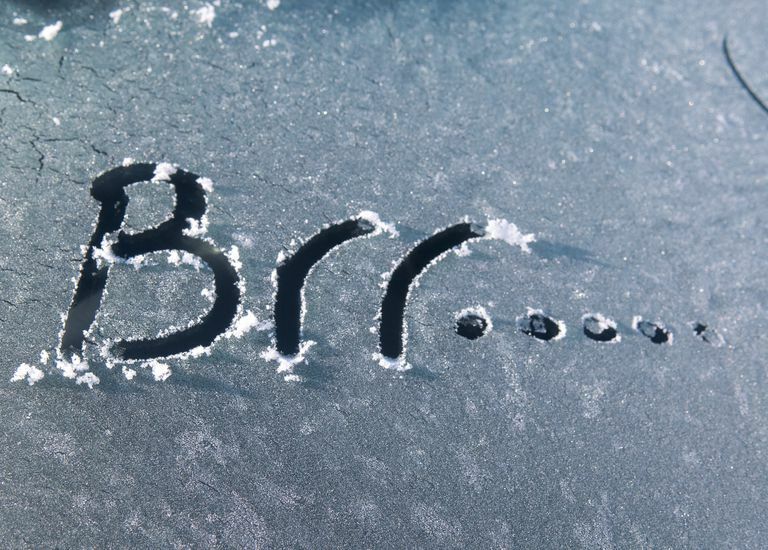 One item needed during the cold months but left alone much of the rest of the year is the heater / defroster. Fogged up windows is an accident waiting to happen. 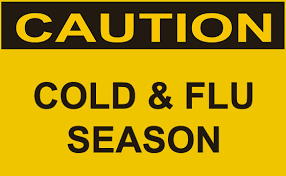 Both the heater and defroster should be examined before use. In addition take a look under the hood are there any leaks, cracks or loose clamps?? Are there any fraying belts that need to be replaced. The oil and air filters should be changed and cleaned. Mince the Garlic Cloves, Slice the Bell Pepper into 1/2″ strips, and use a Mandolin to finely slice the Red Onion lengthwise. Set 1/2 cup of the Raw Onion aside to use as a garnish for the tacos. Open the Canned Young Jackfruit and drain, but do not rinse. Use your fingers to pull apart or “shred” the meat substitute. Add a splash of water, the remaining Red Onion, and Red Pepper to a large pot. Cover and cook over medium heat for about 5 minutes, until softened. While the Onion and Pepper are cooking, Puree half of the flesh from the Mango in a blender or food processor. You want about 1/4 cup of puree for this recipe. Chop the remaining Mango flesh into small cubes, and reserve as a garnish for the tacos. Uncover the Peppers and Onions and add in the minced Garlic and Curry Powder. Let cook for 1-2 minutes, adding a splash of water if things start to stick to the bottom of the pot. Add the shredded Jackfruit, Coconut Milk, and Mango Puree to the pot. 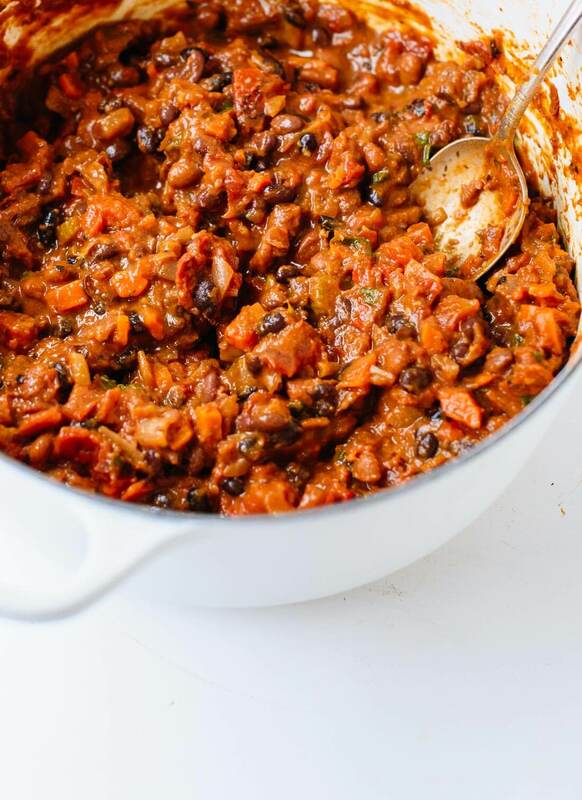 Cover and let simmer for 15 minutes, then remove the lid and let simmer for an additional 5 minutes to allow the mixture to thicken more. Heat up your corn tortillas at this point, if desired. Remove the Jackfruit Curry from the heat, then assemble the tacos. 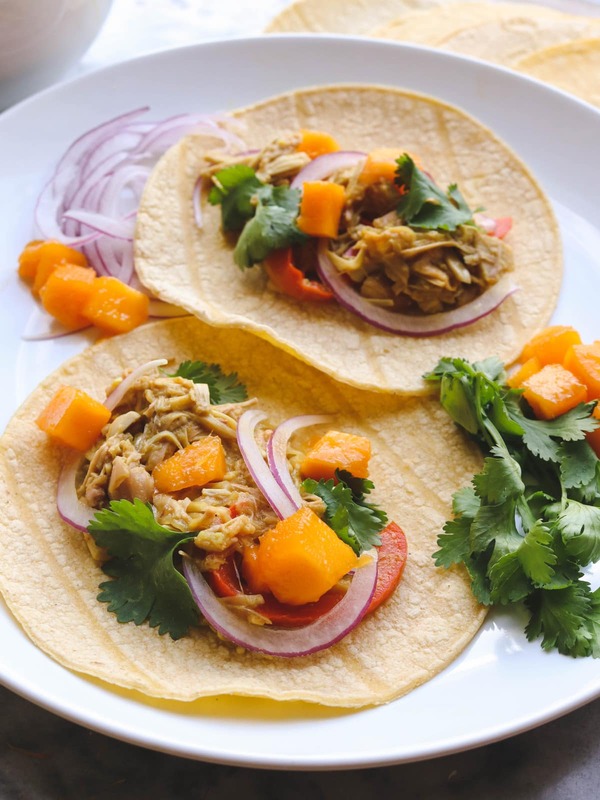 Add a generous scoop of Jackfruit to each Corn Tortilla, then top with the reserved Red Onion, Mango Pieces, and Cilantro. One of my favorite songs shares the idea that we believe everything we hear on the news that we would lose any faith we had in this world. The sad truth is that the world that we share with each other has seen it's share of tragedy, wars and more. I can not think of anywhere that violence has not rang out one time or another. Someone always wants more or want to change the way things are done. There are many different ways to make change, some are done without any violence and yet others are a battle of brute force. For those that strive to do things the non violent way there is a special day in October. 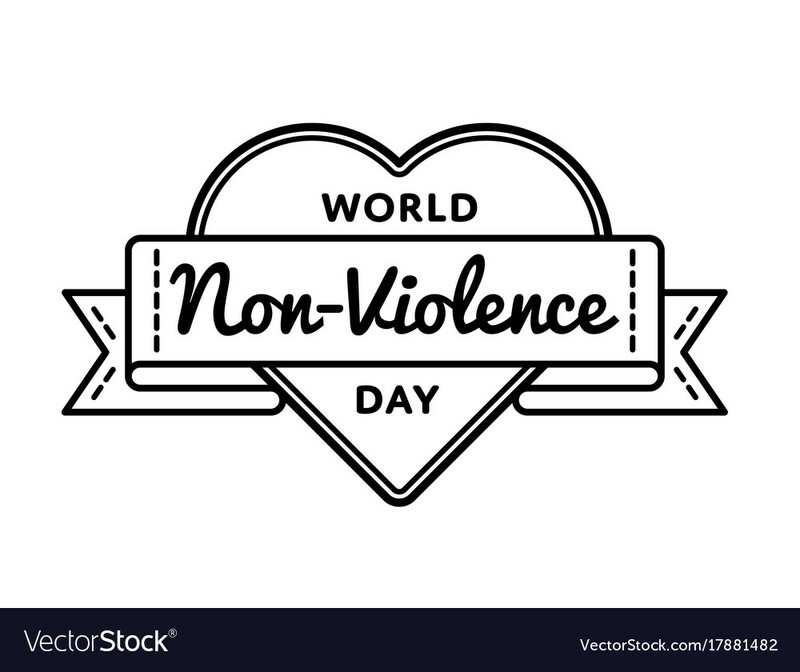 The International Day of Non Violence strives to celebrate and bring awareness to the fact that change can happen and does at peace times as well. The International day of Non-Violence is always observed in October. October 2nd is the birthday of Mahatma Ghandi one of the most influential political activists of all time. Ghandi would use a display of nonviolent civil disobedience to overthrow the British who were in control of India. Through the actions of Ghandi India would eventually gain their independence. Ghandi is known as the "father of the nation" in India. With the example of Ghandi in mind a day of Non-Violence was created. The United Nations General Assembly decided the best date to celebrate the Non-Violent day would be Ghandi's birthday October 2nd. The day is used to bring awareness to ways of non-violence resistance. Non-violence resistance can help bring change to social as well as political issues. Through protesting in marches and vigils as well as non cooperating when told what to do or offering non violent intervention through blockades and occupations change can occur. As a child I would see many things that would make me wonder. My parents were the type that would remind me it was nice to stare. One gentleman that was a friend of my parents looked a bit funny, walked a bit funny and spoke even funnier. Years later I found out that he suffered from Cerebral Palsy. Perhaps if my parents had shared that information with me I would have had even more questions but I would have known, that may of helped me but then I may of been a bit scared as well. Is it not funny that we are often afraid of what we do not know. That is why I enjoy learning and sharing here on my blog Annies Home. Today, we will take a closer look at Cerebral Palsy or CP. 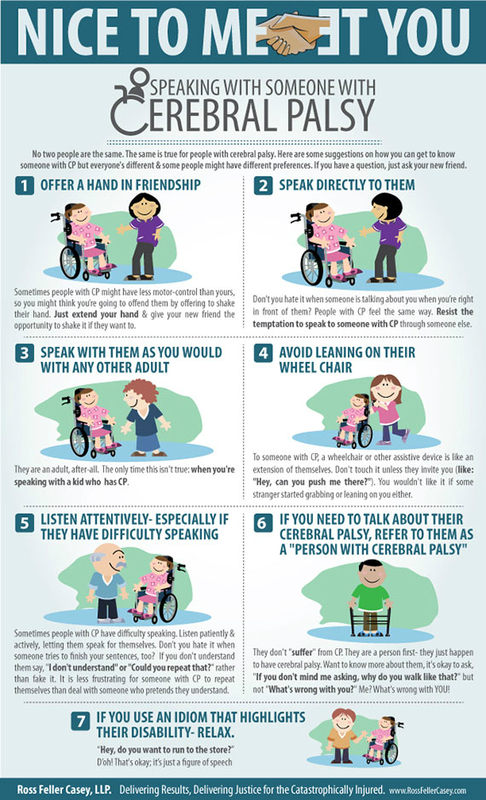 Cerebral Palsy is caused by abnormal development of the brain or damage to the developing brain that affects the ability to control the muscles of the body. Brain damage that causes CP can happen before birth, during birth, shortly after birth, or during the child's first year of life. The damage occurs when the body and mind are still developing. Multiple births such as twins, triplets, and other multiple births are at high risk for Cerebral Palsy as well. Babies of mothers who undergo Assisted reproductive technology (infertility treatment) may have a greater chance of having cerebral palsy. Babies born to mothers who may have had an infection during pregnancy has increase risk. If the mother runs a fever during pregnancy or during delivery there is an added risk as well. Infections known to cause added risk to baby include viruses, chickenpox, rubella, CMV and bacterial infections such as infection of the placenta or fetal membrane or maternal pelvic infections. Babies born to mothers with thyroid problems, intellectual disability or seizures have a higher risk of CP. Birth complications including detachment of placenta, uterine rapture or problems with the umbilical cord during birth can disrupt oxygen supply to baby and result in Cerebral Palsy.